Welcome back to another edition of Saturday Night Movie Sleepovers! This week J. Blake and Dion Baia are celebrating their 4th anniversary of the SNMS Podcast! 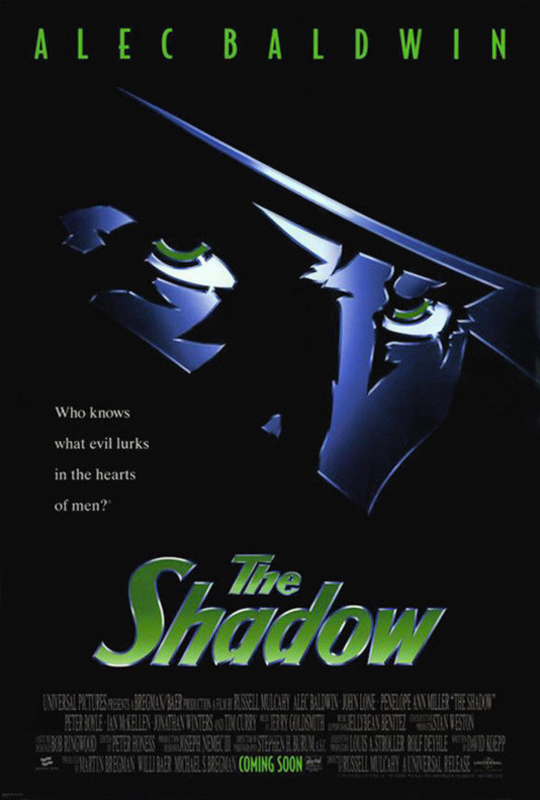 Keeping with the past anniversary episode themes, the boys have decided to cover the Alec Baldwin-helmed big screen production of The Shadow, from 1994! Dion and Blake attempt to dissect this long-established property by going back to its roots in the Walter B. Gibson-penned pulp novels, trying to coherently lay out the different timelines of The Shadow from the radio, in print, and on both the large and small screens. They unpack the elaborate history of the man in black, drawing links to what was actually going on in the world during the early 20th century, and how the character went on to influence one of the most famous superheroes ever created. It’s another educational, hilarious and exciting anniversary-installment of Saturday Night Movie Sleepovers! Check out this amazing book that Blake referenced in the cast, called The Shadow Scrapbook, published in 1979! Take a look at some of this incredible artwork right out of Blake’s stash in the SNMS Archives, of The Shadow! As Dion and Blake have proudly endorsed in the past, to begin your journey exploring the labyrinth of Old Time Radio, click here. And to check out the The Shadow Radio Program directly, click here! Welcome True Believers to another all new episode of Saturday Night Movie Sleepovers! This week J. Blake and Dion Baia are talking a character that is a personal favorite of the boys- particularly J. Blake -and with a new film hitting theaters this week, what better time then to discuss a certain New York City Web-Slinger! That’s right, your ‘friendly neighborhood Spider-Man‘ is the topic and his journey through television with an emphasis on the 1977 TV movie entitled just Spider-Man, and the live-action series that blossomed out of that movie pilot, The Amazing Spider-Man, which ran from 1978 to 1979. 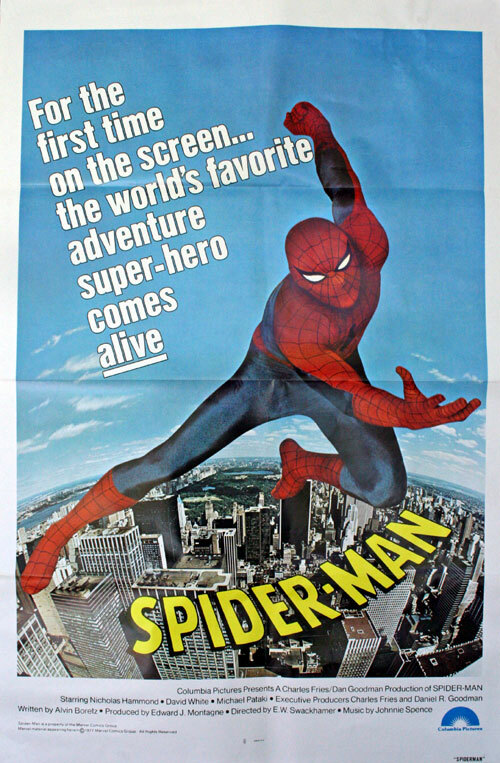 With such a huge topic to cover, the boys initially set out to only talk the 1970’s live-action series but decided they needed to touch on the original 1967 Spider-Man cartoon series that ran until 1970, as well as the first live-action appearance of the character which appeared on of all places, PBS, on 1970’s series The Electric Company. 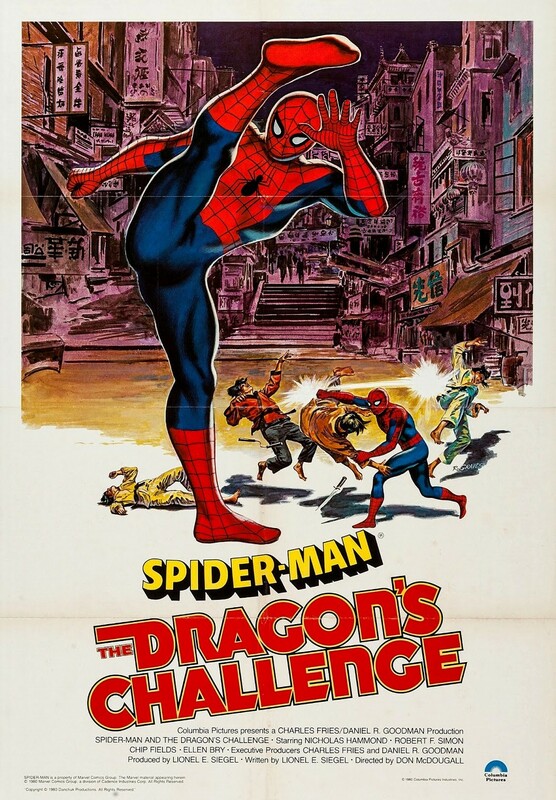 They also felt compelled to discuss the little known, but amazing (no pun intended… or maybe it was…) live-action Japanese TV show entitled Spider-Man (or Supaidâman) that ran from 1978-1979, coinciding with the live-action America series. 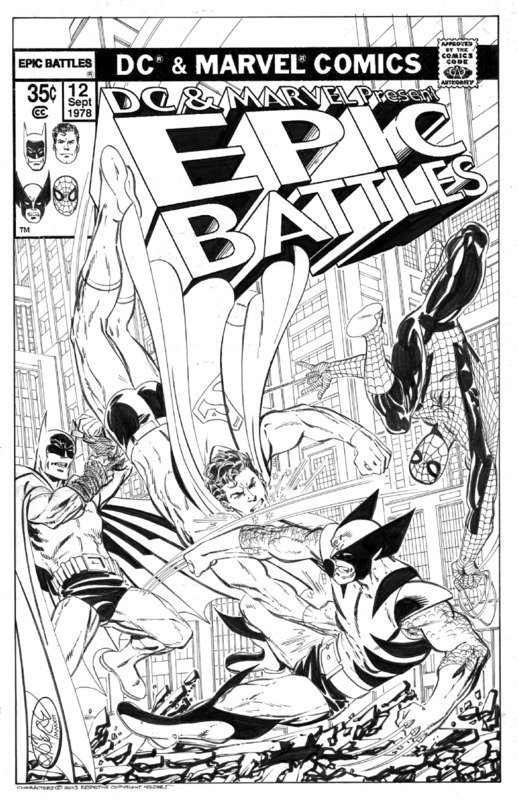 The fellas do touch upon the other iterations of Spidey in his various animated forms but set up the conversation by going into how much of an influence the character was for Blake growing up, even as far as a very young Blake (with the help of his Mom) submitting Spider-Man artwork to Marvel in hopes of becoming an artist there. The boys then go through the history of the character: summing up comics in the Golden Age, specifically pre and post war; Timely / Atlas Comics’ evolution into Marvel Comics; and Stan Lee‘s fight to breakout of the then-standard storytelling molds for comic books of the day, to be able to tell new kinds of stories that humanize the characters portrayed within. From the 1967 cartoon and appearances on The Electric Company, they dive deep into the 1977 TV movie ‘Backdoor Pilot‘ (as it was called), to the last two-part episode of that series in 1979 called The Chinese Web, released theatrically later as The Dragon’s Challenge overseas. They also breakdown the pilot to the 1978 Japanese show and try to put into words how much the Japanese show blew their minds… So could it be argued that Spider-Man‘s origin story is in fact more tragic than Batman‘s? How does the life-action adaptations from the 70’s hold up? And just how freaking amazing is the Japanese show really? Well make sure you grab some extra web cartridges, your camera and pack a lunch, cause we’re swinging through the glass and cement canyons of New York City this week in an all new and exciting installment of Saturday Night Movie Sleepovers! 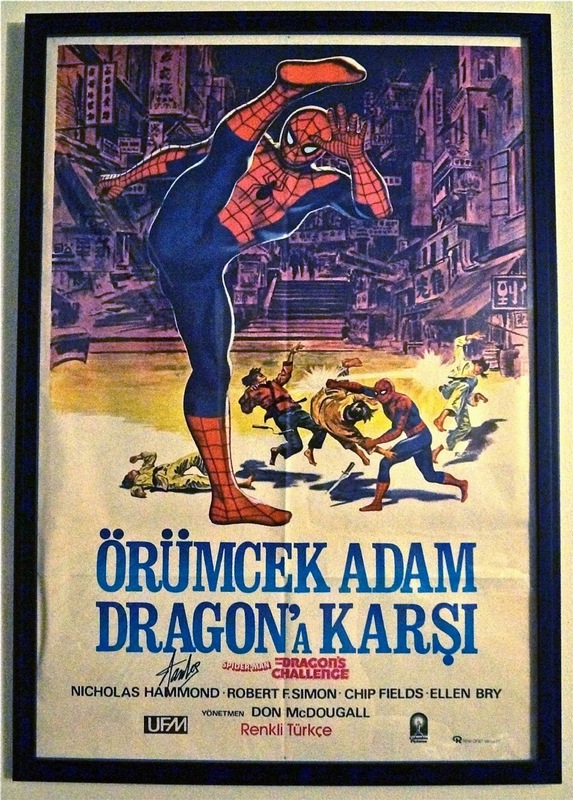 Take a look at Blake’s Turkish Spider-Man poster for the theatrical release of The Dragon’s Challenge, signed by Stan Lee! AND here is the American edition of that same poster. As brought up in the podcast, here is a link to the Society of Illustrators‘ current exhibit on The Art of Spider-Man. Check out the original 1977 ‘Backdoor Pilot’ TV movie that greenlit the 1970’s series, courtesy of YouTube! Here’s Stan Lee talking about why he disliked the 1978-79 American television series. Have a look at the great opening for the 1978-79 Japanese series, with subtitles! And if you didn’t believe the boys about the awesomeness of the Japanese series, have a look at this trailer for it’s re-release from Marvel.com! 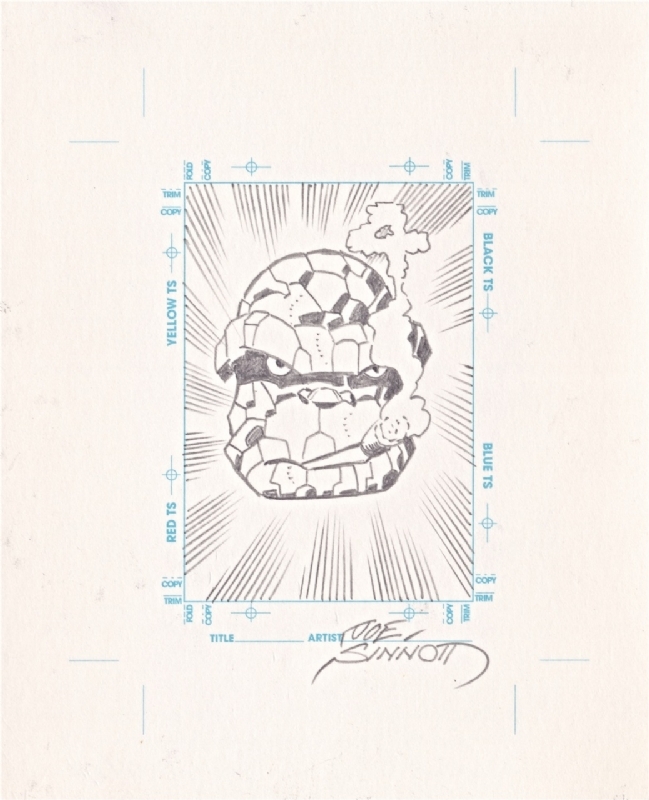 For anyone who didn’t know or forgot this existed, please check out the full video of How to Draw Comics the Marvel Way, from 1986, starring Stan Lee and John Buscema! Also discussed in the podcast, have a listen to Michael Bublé‘s great big band cover of the 1967 animated series theme, which starts as Sing Sing Sing and segues into Spider-Man. And to the show how popular this rarity must of been overseas, check out this live version with stage show, on Italian TV! 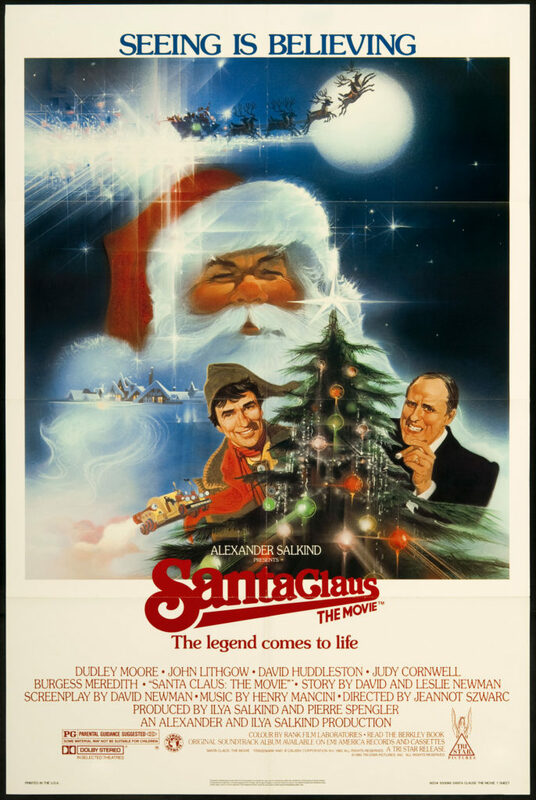 With Christmas just days away, J. Blake and Dion Baia decided to seek out a film that actually was the first to attempt to lay out the backstory of old St. Nick; a movie that sadly came and went, and like any good holiday film, it’s a perfect time capsule for the era it was made within. We’ve got Santa pitted against the evil and greed of the 1980s, in Jeannot Szwarc‘s Santa Claus: The Movie, from 1985. This forgotten gem starring the great Dudley Moore, David Huddleston and John Lithgow immediately have the boys thinking back to the Christmas’ of their childhood, and the memories that come along with those experiences, like the Sears and J.C. Penney catalogs and their toy sections, or shopping with Mom and watching her use coupons for everything and then get rainchecks for what was on sale but had been 86-ed. And because of the product placement and connected marketing campaign, it has Dion and Blake longing for a McDonald‘s meal circa 1985, and all it’s unhealthy heavenly glory. 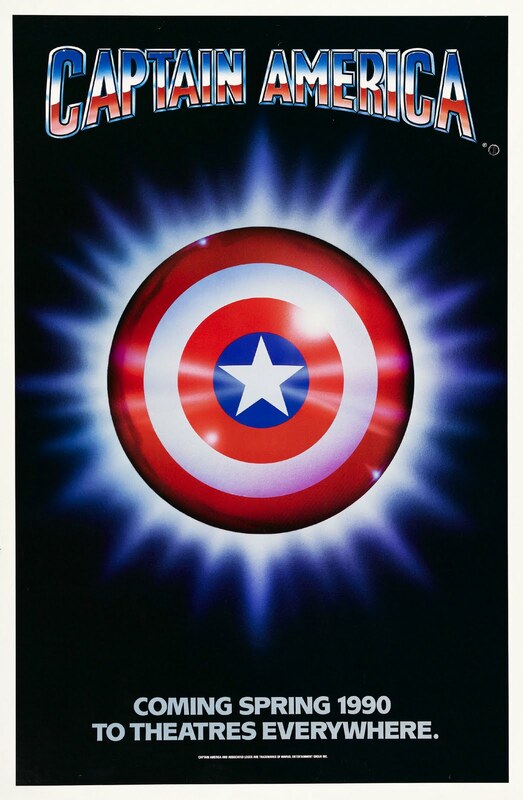 They discuss the superhero-esque origin story, and relish in the glorious pre-CGI practical effects, and the beauty that has been lost in those antiquated Special Effects. 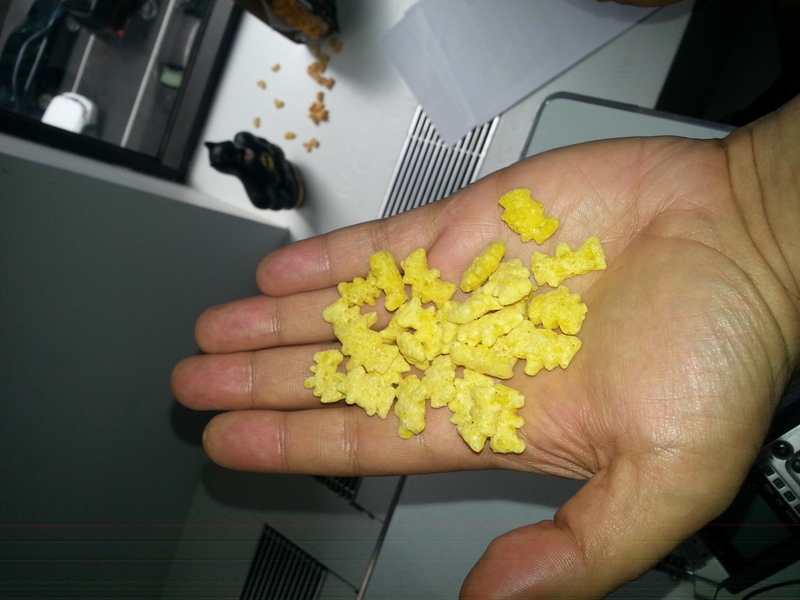 So playing the SNMS-patented “What-if ?” game, who were some of the other directors considered to helm this film? Was a legendary horror director actually topping the list to, at one point, oversee this project? 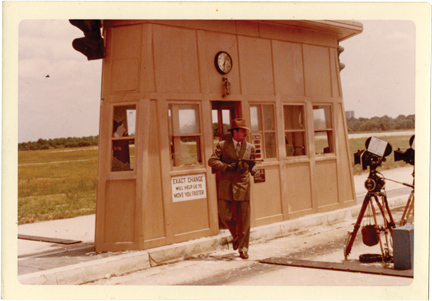 Was this entire movie, including the parts in New York City, shot on a soundstage in another country entirely? And is it really unheard of to have that many wild reindeer pull a sleigh? Well, this week the boys hook up with the Vendequm and watch them fulfill their centuries-old prophecy, in an all new Holiday Edition of Saturday Night Movie Sleepovers! Check out the original trailer for Santa Claus: The Movie! Take a look at an original 1985 TV spot. Here’s a great example of the product endorsements tied into the movie, where we have the elves selling Kodak Disk Cameras! And here’s local reporter Roy Leonard from WGN Channel 9 reviewing the film on the nightly news, circa 1985. Due to the astounding popularity and success of our last series of interviews with retired NYPD Homicide Detective Randy Jurgensen that aired here last December in 2 parts, and because of the content of last week’s SNMS episode on the 1980 film Cruising, we decided to reissue our first groundbreaking interview which originally ran in February of 2012 on our now defunct sister site, The Podwits.com. So the name Randy Jurgensen doesn’t sound familiar to you? Well, believe it or not you know him. The retired NYPD Homicide Detective and film icon has acted in and produced dozens of films, and has worked on some of New York City’s most famous cases. 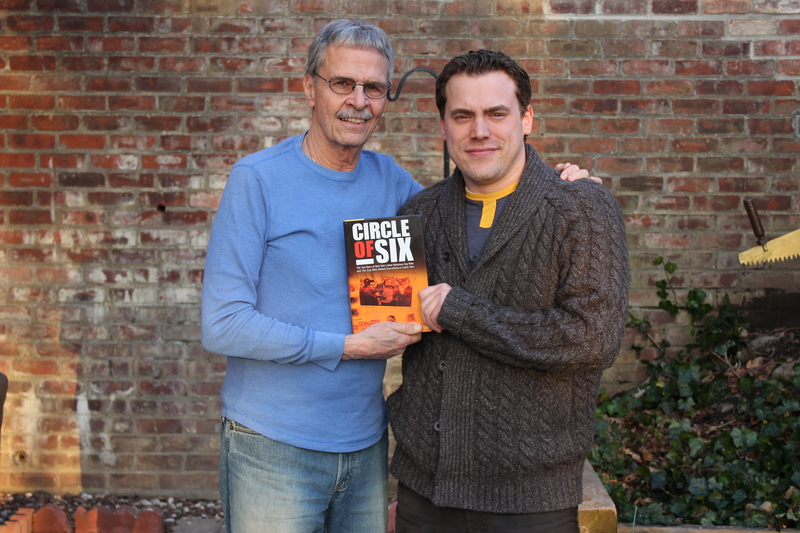 His book, Circle of Six, is his real-life tale of going against the system and practically the entire department brass in order to bring to justice the murderer of a fellow brother-in-blue, in what turned out to be one of the city’s most notorious cop killings. This passed April marked the 44th anniversary of the killing of Officer Phil Cardillo at Mosque #7 in Harlem, and the case that forever changed the seasoned detective as well as the fabric of the entire New York City Police Department. 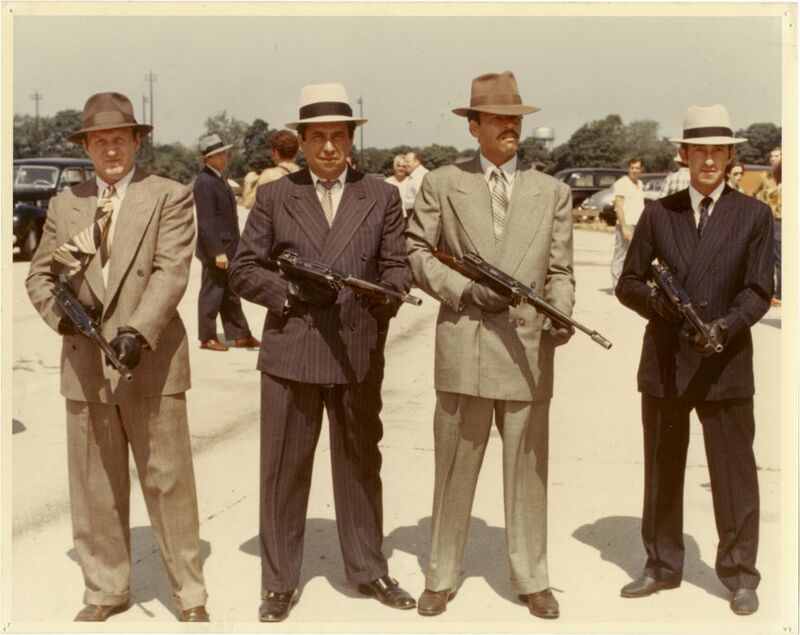 In this SNMS EXCLUSIVE, Randy sits down with Dion Baia and talks about his very colorful career as a homicide detective and his unlikely segue into the cinema. The NYPD veteran gives his opinion of the mindset of the police hierarchy that made it so hard to be a policeman in New York City in the 60’s and 70’s. He recounts his involvement in the Patsy Fuca case, which became the 1971 film The French Connection. Perhaps for the first time, Jurgensen goes into detail of the sequence of events of the case he was assigned to, having to go underground into the gay leather-bar scene in the 1960s which eventually because the Al Pacino film Cruising. The Homicide Detective also discusses a crime scene that to this day still haunts him, and how he learned how to deal with ‘the job’. He then explains why it was so easy for him to make the gradual transition from detective to film consultant, actor and producer, examining his career in cinema. Mr. Jurgensen goes into his close friendship with legendary director William Friedkin, and actor Joe Spinell among others, and his memories working on films like The French Connection, The Godfather, Maniac, Cruising, Superman, and Sorcerer, among others. So what famous person was Jurgensen temporary pulled out from undercover to then go and arrest? What did his old childhood friend, legendary comedian George Carlin have to say about that notorious arrest? And what special message (through Dion) does actor Ed O’Neill have for Randy? Well come on and listen to a groundbreaking and highly educational episode of Saturday Night Movie Sleepovers’ Side-Cast! 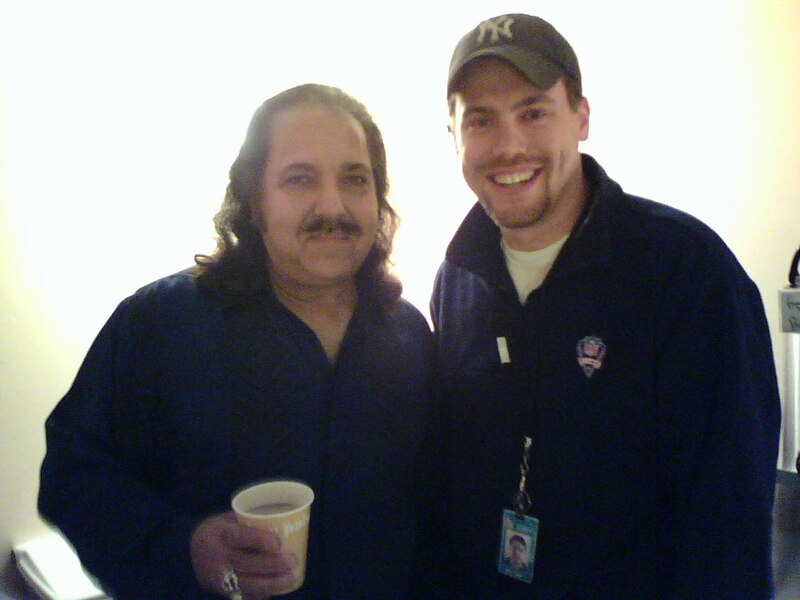 Here are Randy and Dion in 2012 after recording this interview. 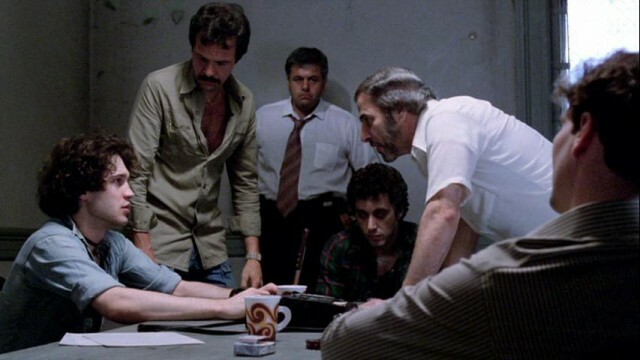 Have look at Randy in Cruising, interrogating Al Pacino, as Paul Sorvino and Ed O’Neill look on. 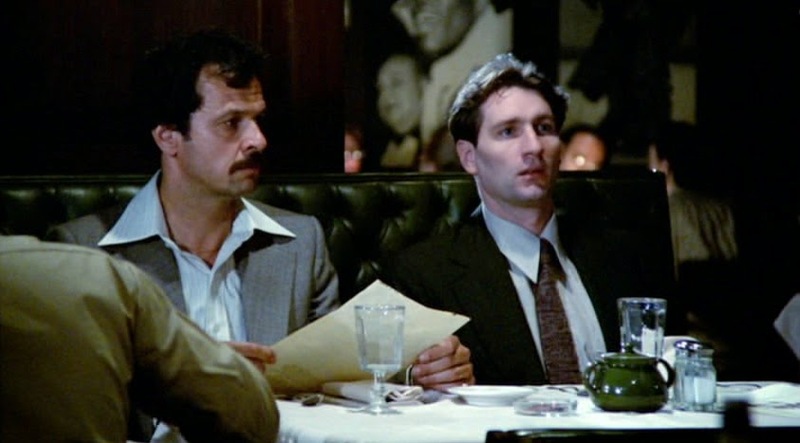 A young Ed O’Neill and Randy share a scene together in Cruising. 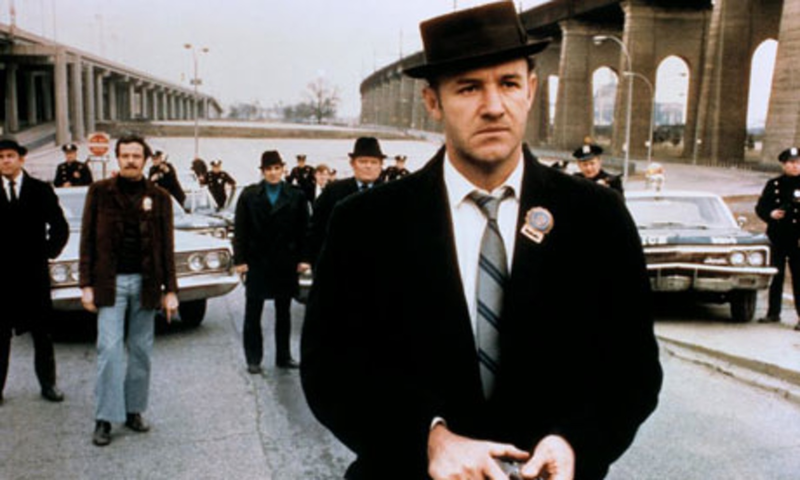 Gene Hackman in The French Connection, with Randy over his right shoulder. It’s that time once again… Welcome back to another, exciting edition of Saturday Night Movie Sleepovers! This week Dion Baia and J. Blake are covering a true epic, a film that was meant to return a property back to its original source material, and also reinvigorate a franchise that had been around (at the time) close to seventy-plus years. This go around the boys are taking on Greystoke: The Legend of Tarzan, Lord of the Apes, from 1984. Blake and Dion have a lot on their plates to get through: first laying out the backstory that legendary writer Edgar Rice Burroughs set up in his original 1912 novel Tarzan of the Apes when creating the title character, and the bigger role Burroughs played as one of the original pillars in the Pulp Tradition. They give an overview of that groundbreaking genre, and explain the vast influence it still has on the entertainment we seek out today. 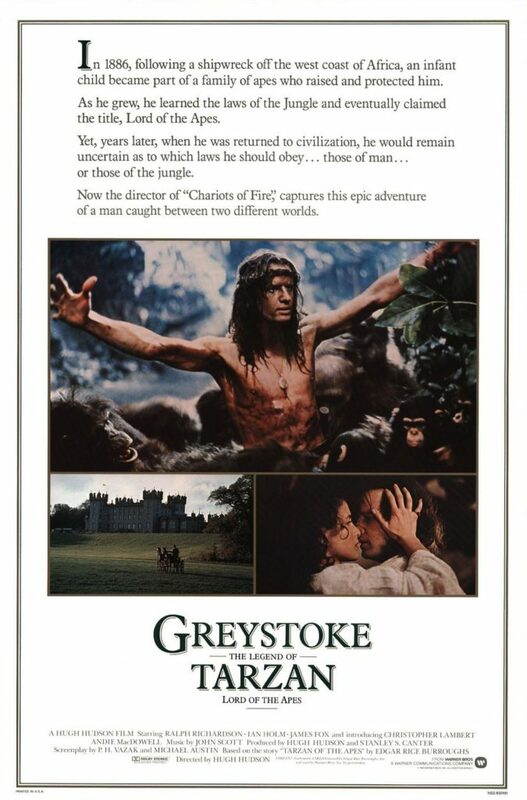 They also discuss sci-fi writer Harlan Ellison‘s scathing review of this film Greystoke, and use that critical essay as a template in comparing this 1984 version to Burroughs’ original work, and if it is indeed appropriate to label this work “the definitive version“- is it a fair criticism? The lads also go into depth about Rick Baker‘s groundbreaking contribution to this project, and how his help specifically was the key in getting this production off the ground. But what was the reasons for having the screenwriter, Robert Towne who penned this script, sacked as director of this adaptation? What other problems did a production like this run into while trying to get this project off the ground? What exactly is the Wold Newton Family, and how is it connected here? And is Dion really a Lord ? Well come on and have a listen as the fellas match an epic movie with an epic cast as they attempt to answer all the questions in this all new episode of Saturday Night Movie Sleepovers! Read Edgar Rice Burroughs‘ 1912 book, Tarzan of the Apes, absolutely free! As talked about in the podcast, here is a link to some of the Rick Baker props that went up for auction that were specifically from Greystoke. Check out the original trailer for the film! Have a listen to composer John Scott‘s overture! For further writing on sci-fi writer Philip José Farmer‘s Wold Newton Universe, click here. Also created by writer Edgar Rice Burroughs, here is concept animation from an never-produced 1936 animated John Carter of Mars series, which was helmed by legendary animator Bob Clampett. 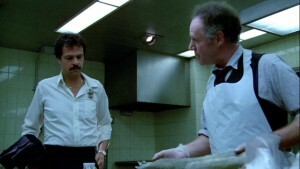 The very iconic photo of the finale of The French Connection– Randy can be seen over Gene Hackman‘s right shoulder. 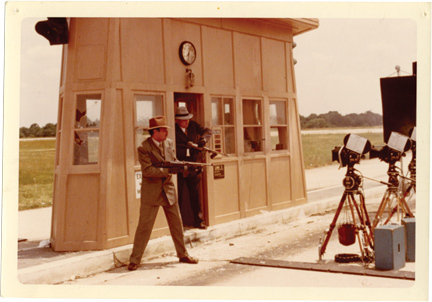 Here, here, here and here are behind the scenes shots of Randy on set on The Godfather, during the scene where Sonny is assassinated. 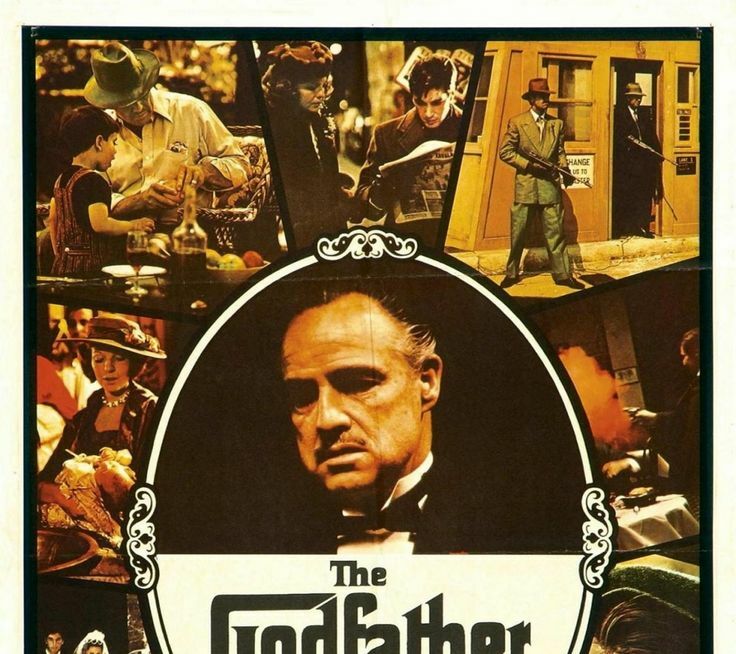 Check out Randy in The Godfather poster, up in the top right corner. 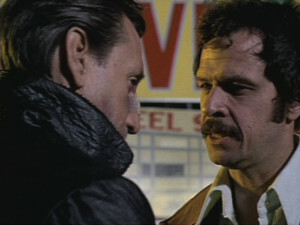 Here’s Randy at the end of Maniac, with real life partner Jimmy Aurichio! Have a look at another picture from Cruising, with Randy center, interrogating Al Pacino, with Paul Sorvino standing against the wall. Here’s another from Cruising, this time with a very young Ed O’Neill. Subscribe to SNMS on iTunes! Listen to SNMS on Stitcher! Listen to SNMS on PlayerFM! Happy Thanksgiving! Here at Saturday Night Movie Sleepovers, J. Blake and Dion Baia have lined up another, albeit lesser known holiday film that not only celebrates the Turkey-Day Season, but also is a John Hughes movie to boot! 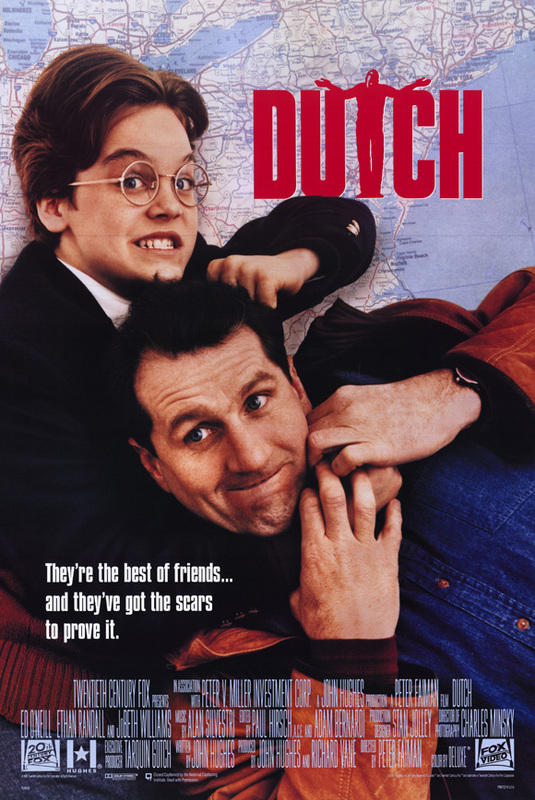 This year the boys are talking up the classic Dutch, from 1991, starring Ed O’Neill and Ethan Embry. Who Do You Love is the other 2008 film that came out along with Cadillac Records that documented the Chicago Blues scene and Chess Records artists in particular, that the boys couldn’t remember the name of. 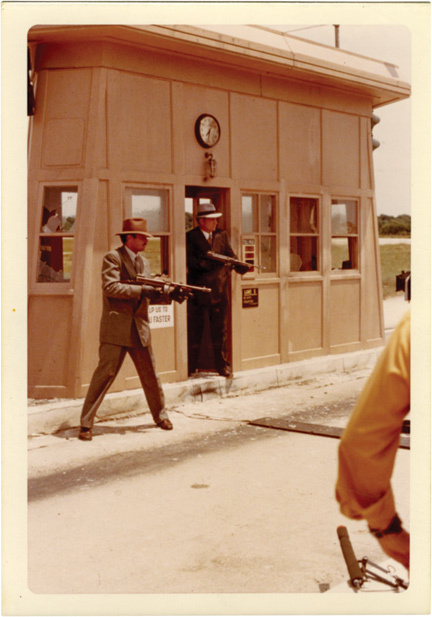 Check out the original theatrical trailer for Dutch! Who knew?! Here’s Jiu-Jitsu practitioner and Gracie Academy Black Belt Ed O’Neill, with Ryron and Rener Gracie breaking down the moves of the 2012 UFC Belfort/Jones match. Speaking of Jiu-Jitsu, listen to Ed O’Neill tell the story of his VERY First Class at the Gracie Jiu-Jitsu Academy with Grandmaster and UFC co-founder Rorion Gracie. 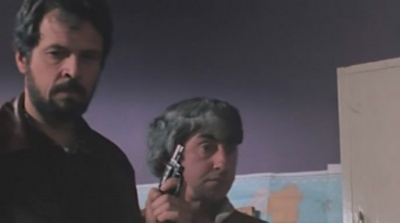 Take a look at some of the 1985 TV pilot Popeye Doyle, the spin-off sequel to The French Connection police officer of the same name, that was never picked up and made into a series. This week is a celebration here at Saturday Night Movie Sleepovers because we’ve turned ONE year old! To usher in the monumental anniversary, J. Blake and Dion Baia have recorded a podcast that could be their most EPIC yet, presenting a film that played a huge role in their upbringing and practically revolutionized Hollywood moviemaking and marketing in the late 20th century; basically the 1977 Star Wars of their generation. 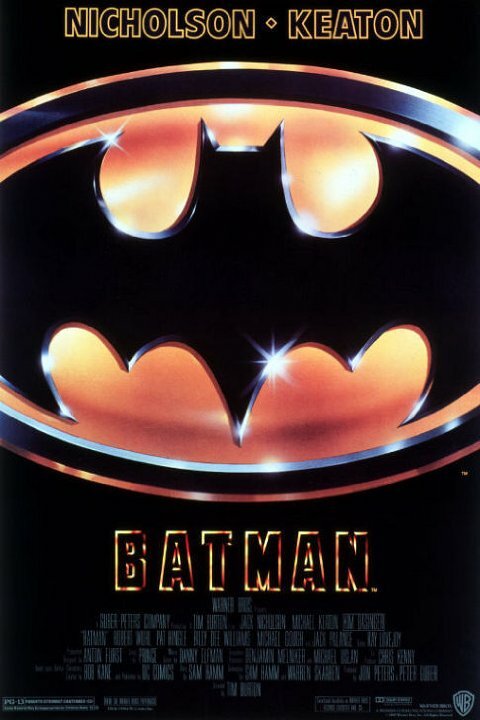 If you haven’t guessed it already, we are speaking about 1989’s Batman, directed by Tim Burton. Dion and Blake start off by reflecting on turning a year old, and the humbling experience it has been to hear from the fans they’ve gained who share the same love for movies as they do. 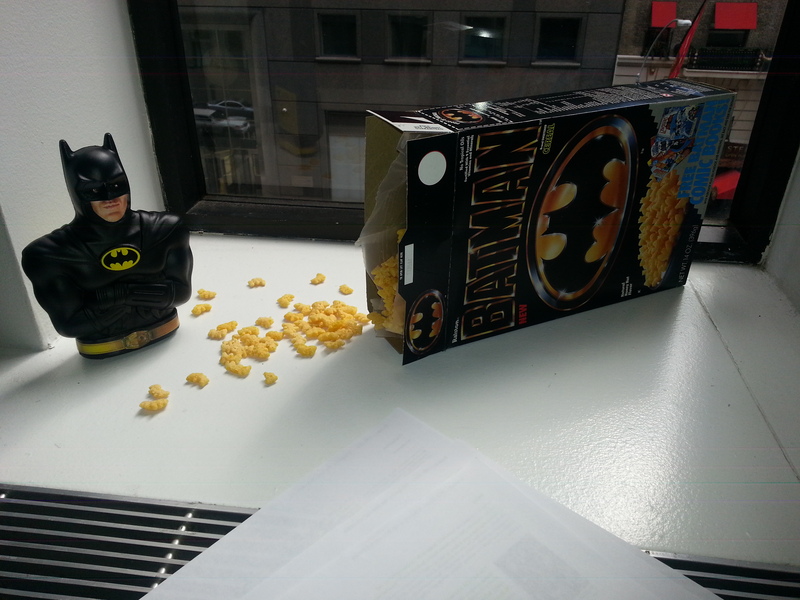 The fellas chat about being part of a nostalgic generation, and attempt to set-up what it was like for them to be 10 year-olds living in a pre-Batman era and then live through that unbelievable summer of 1989, a perfect storm which has been dubbed in the annuls of history as Batmania. 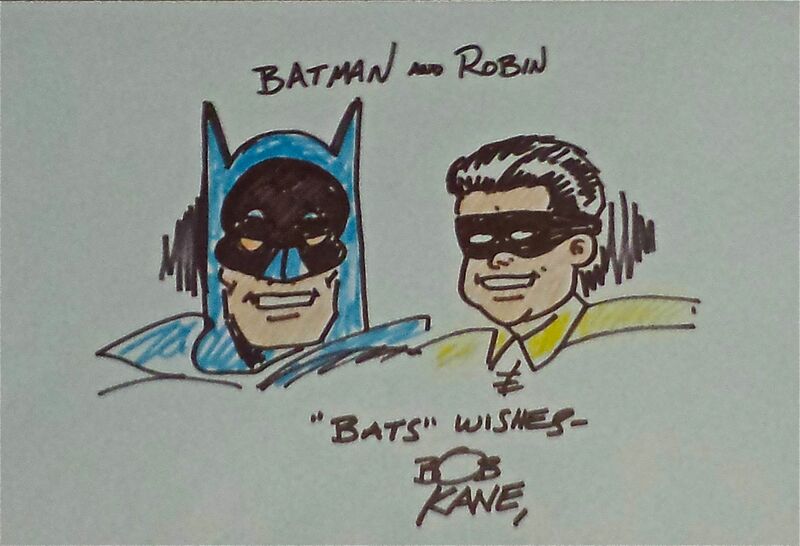 Then they get into all things Batman: The lads go back and setup the history of comic books, from dime-store novels, pulp magazines to comic strips, and detail the elements in the culture that helped Bob Kane and Bill Finger create the Dark Knight. 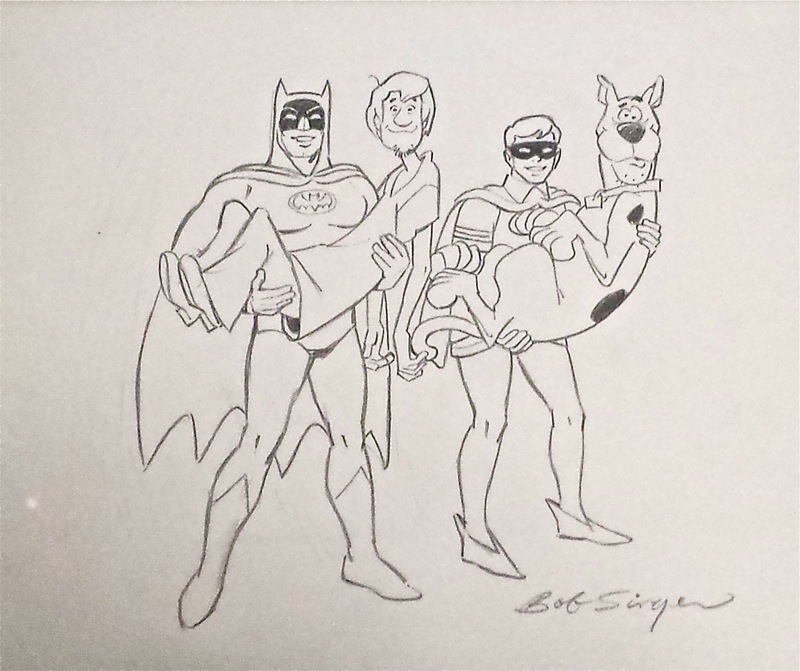 The boys proceed to go through the various eras of Batman, from the post WWII 50’s era Fredric Wertham crusade to clean up comics, to the ‘Pop‘ 1966 show that defined an era, to the ’70’s and ’80’s push to bring the character back to his roots. Once they get to the main course, Tim Burton’s 1989 tour de force, they track the 10-year journey of getting the film made, the various casting challenges posed (with Dion and Blake playing the BIGGEST version of their ‘What If ?‘ Game EVER), and even tackle the argument of who was a better Joker: Jack Nicholson or Heath Ledger? Not to mention the 26 year-old surprise that could ultimately send them both to the HOSPITAL to get their stomach’s pumped! Yes, as epic as this description is, it barely scratches the surface of this MEGA podcast to commemorate Saturday Night Movie Sleepover‘s one year anniversary. Go ahead and have a spin today! To close out the long and hot summer, J. Blake and Dion Baia have embarked on a journey that will take them out of the trailer park canyons of California and up into the galaxy to help defend the cosmos against horrifying alien evildoers who are hell-bent on, well… doing whatever they plan to do- and the key to this adventure is provided to us by one cleverly disguised, humble arcade game console. 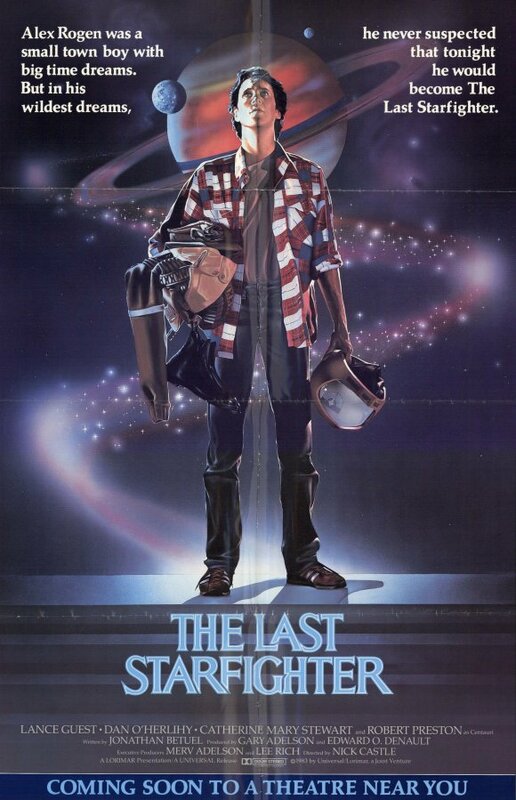 Yes, we are talking about the highly-underated 1984 film The Last Starfighter, directed by Nick Castle. Yes Joystick Jockeys, this cult classic is hailed as the first film to showcase CGI Imagery to replace the tradition Stop-Motion and Practically Special Effects, and is sometimes forgotten for that milestone. But how does a space film in a post-Star Wars world stand out without ultimately being compared to the property that set the bar? The boys reminisce about the era of the late 1970’s and 80’s when one actually had to go out of their house and travel to a local arcade or restaurant if they wanted to socialize while gaming, and/or see the latest and greatest in video game technology vis-à-vis the big console units. Has time and the public been fair to this ground-breaking film? Can this movie actually be considered as influential as Star Wars in certain circles? And what’s this film’s 3-way connection to John Carpenter? And does Blake‘s Lance Guest story really involve a late-night encounter in the adult section of a 24-hour New York City store? Well we’re not pulling any punches on this all new edition of Saturday Night Movie Sleepovers! Inter-stellar!! 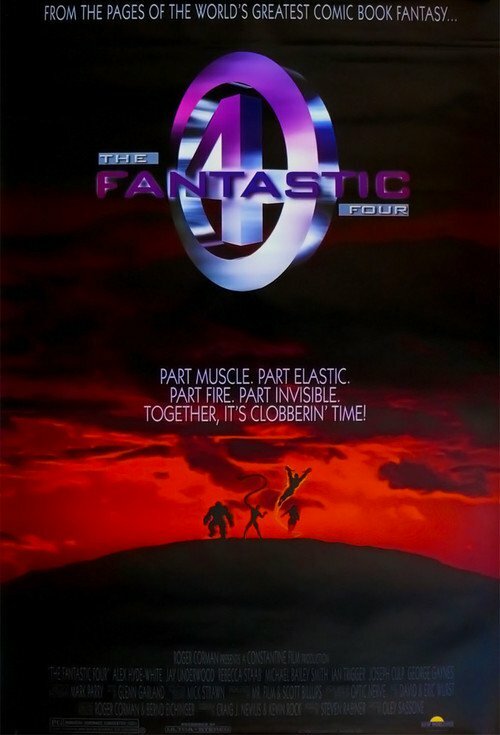 Well truly believers, with the upcoming release of the latest Fantastic Four reboot, Dion and Blake thought they’d go back and revisit a classic. A film so notorious in the annals of history for maybe all the wrong reasons, being that it never even got released and was instead shelved! We of course are talking about the Roger Corman classic, the original Fantastic Four film, from 1994. The boys set the scene and discuss the context of the early ’90’s and what the FF was up against, as well as other movies that never got nearly as far in production, but met the same fate. Dion and Blake also debate probably the largest question everyone has: why the heck was this film never released, even after it was allowed to be completed? Could the powers-at-be have found another way to repurpose this film in some way, and not have written it off as a total failure? Did Roger Corman‘s company that got FF finished on such a shoe-string budget, actually hinder it’s release? Is it fair to compare this to something that Troma Studios would put out? And on the subject of Troma and Lloyd Kaufman, J. Blake regales us with story of how he actually worked at Troma which only lasted a week… This week’s edition of Saturday Night Movie Sleepovers is a must listen, dissecting a film that may go down as one of the most sought after bootlegs in cinema history. Come download it today!